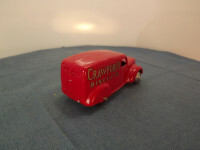 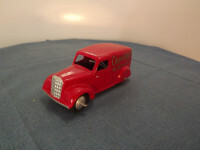 This model is the Dinky 28l-G-3 Bedford Delivery Van in Red Crawford's Biscuits livery. The 28l was originally issued between 1934 and 1940. This Code 3 has been reproduced quite well, probably using a 34c/492 casting as there is evidence of a repair to the roof where the Loudspeakers would have sat. 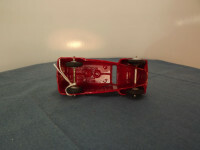 All wheels are of the shaped cast metal type - solid one piece cast metal hubs, painted silver, with a separate black "rubber" tyre. The original Crawford's van was issued in 1934-40 — this code 3 version was probably made between 1975 and 1990 by a private collector for his personal collection and it has now passed into my care following his death.